WEC Group Ltd was recently awarded for its commitment to their apprenticeship scheme at the Lancashire Telegraph business awards where they won the coveted Training & Development award. The judges at the awards were impressed with their commitment to the pioneering Welding & Engineering Training Academy, which has already seen over 45 engineering apprentices go through its doors in the past five years. As the only welding & engineering apprenticeship scheme of its type in the UK, the Engineering Training Academy has an excellent reputation. 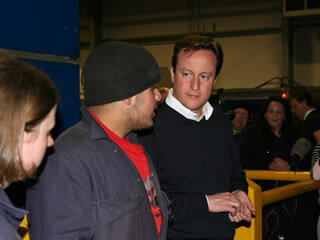 A visit by the Prime Minister David Cameron further highlighted the importance of apprenticeships for the growth of the economy. Mr Cameron praised the apprenticeship scheme and WEC Group's commitment to providing first class facilities and training, especially in the current economic climate. Description Prime Minister David Cameron's visit. The WEC Training Academy has recently been awarded certification to deliver the NVQ Diploma in-house and the new influx of apprentices for 2010-2011 will be the first to benefit. Apprentices spend four days carrying out practical work at the Training Academy and one day learning the theoretical side of welding and fabrication. 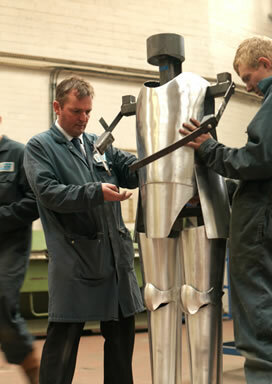 Description Fabricating a suit of armour. Copyright WEC Group Ltd © 2017. All Rights Reserved.